Our final destination was another overlooked spot in the tourist trail. Island hopping at Honda Bay is a must-do in any visit to Puerto Princesa, but boatmen often just skirted the shallow offshore reef near Lu-li Island, unaware of its potential for snorkeling. 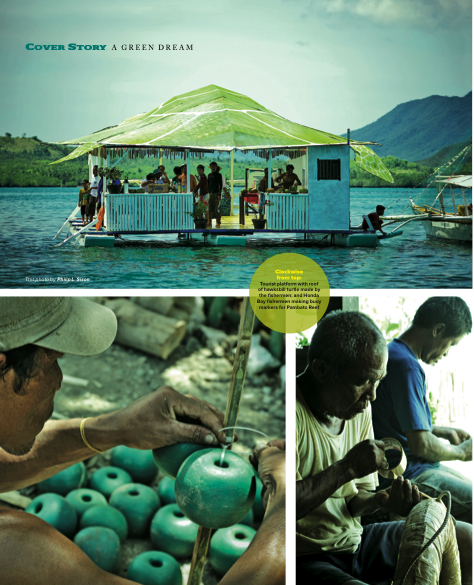 Gerry worked with another group organized by ELAC, the Honda Bay Boatmen’s Association, in developing tourist facilities near the coral reef they called Pambato (contender). It has been dubbed a “mini-Tubbataha” so I had to see for myself whether it could really compare with the World Heritage Site in the Sulu Sea. The reef was teeming with live corals – a field of mushroom corals, a cluster of table corals, and branching corals everywhere. But I was disappointed to find only a few fish, not even a clownfish near the sea anemones. There were parrotfish, surgeonfish, and some angelfish but it was definitely nowhere near the diversity of Tubbataha. 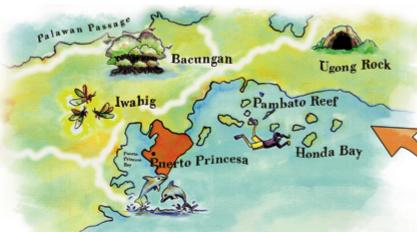 What makes Pambato Reef a delight, however, is the floating platform with a roof in the shape of a hawksbill turtle. Made of fish nets and metal pipes, the artistically designed structure provides good air flow and is sturdy enough to withstand a typhoon. Bamboo chimes flutter in the wind, and a matching baby turtle floater is used to ferry swimmers. The entrance fee of P50 per guest adds to the boatmen’s income. SWEAT EQUITY - In every eco destination, local partners put in labor and creativity as their “sweat equity” in developing tourist facilities, says Bayanijuan's Gerry. Major supporters of the venture are the department of Tourism, which provided P1 million, and the city government, which gave an additional P2.5 million. Gerry also tapped the local academe and environment experts for the educational modules, the City Tourism Office for training tour guides,and the Palawan NGO Network for marketing the tours. “We became the catalyst,” said Gerry. What’s unique about Palawan is that it is easier to collaborate among groups in working towards environmental goals. High awareness about ecology among residents is also helping the project achieve its triple bottom line: to benefit the community, protect the environment, and make the guests happy. Those are great projects...certainly shows the way for other projects! galing oggie! another great contribution to seair's inflight magazine. good that you post the text and the photos here. When i was in puerto prinsesa a couple of years back, due to time limitation, i was given a choice between going to underground river and island hopping at honda bay. i chose the former and hopefully i could do the latter soon. i will anticipate your posts on honda bay bro. sidney, i thought so, too.